Yeah, hard work can sometimes be the answer. But I believe that in a lot of cases it’s not. Do you want to travel around the world? Work hard! Do you want to have more times for your hobbies? Work hard! Do you want to write a great novel? Work hard! Do you want to land an acting gig in Hollywood? Work hard! Do you want to spend more time with your friends and family? Work hard! Do you want to be happy? Work hard! In fact, sometimes working hard is the major blockage between you and your dreams. Sometimes you may need to work less. You need to work less to chase a new hobby or career. You need to work less to earn more. Yeah, that’s right. You may find the right levers instead: build a personal brand, systematize your business, partner up, delegate more, choose a better market, a better business, a better career. Billionaires don’t work 2783274323834 hours a day. Yeah, many of them are workaholics, but they typically don’t work over 24 hours a day. Limitation #1: if I work less I’ll starve to death. This is actually partially true. If you work less without changing what you work and how you work you may actually get evicted. Many people take the 4 Hour mantra and apply it in the wrong context. Let’s say right now I’m a designer and I make $5000 a month while working 160 hours / month. I want to make $5000 a month while working 20 hours / month for the same clients, in the same way. Well, that’s kind of dumb. You may upset your clients and loose your current revenue streams. On the other hand, if you build a personal brand or an audience, you sell consulting or you partner up that projection may become totally achievable. In other cases, you may need to make more radical changes, learn new stuff or open up a new type of business. Another trap I’ve encountered and saw in others: moving into a new venture half halfheartedly. This is even more subtle and dangerous than the first one. Let’s take a simple example. I want to build a personal brand as X. I feel deep in my heart that I’d like to write, record podcasts, appear on TV shows and speak on stage. But I’m afraid. So what do I do? I stick to the same old same old familiar and known techniques. I’m bringing my fears and limitations into the new venture. Another example. I want to delegate. But I also want to have full control over the execution process. Nobody does it better than myself, afterward! So I’m choosing to do something new but I’m doing it in my old, familiar way. I let my fear to run the show. Often times in life we want something but we’re also afraid at the same time. When that happens it can be only one winner: YOU or the FEAR. When we choose a new field but we’re refusing to try new stuff out, we’re blocking the Magic and Potential of the process. Yeah, it may be uncomfortable in the short run to make a bold change. It may be painful, stressing and you may loose your sense of reality. But you’ll also get familiar with the new situation sooner than you’d expect. And you’ll enjoy the benefits of your courage to choose growth over comfort. A common thing I’ve noticed with the “hard workers” out there (myself included) is a strong anxiety towards change. The hard work serves as a defense mechanism to block out deeper emotions and fears. The harder I work, the less I have to face my emotions and those tough, messy, unpredictable moments in my life. The workaholic attempts to control life and environment around him through hard work. But that rarely works. It just kills the life’s magic and serendipity. For hard workers, 1+1 always equals 2. For people who dream 1 + 1 may equal 24. Or 8.473.829. So, screw hard work! Let’s do magic instead! Hey, I found this cool article on the Internet and thought about you. Maybe you\'ll enjoy it as well. 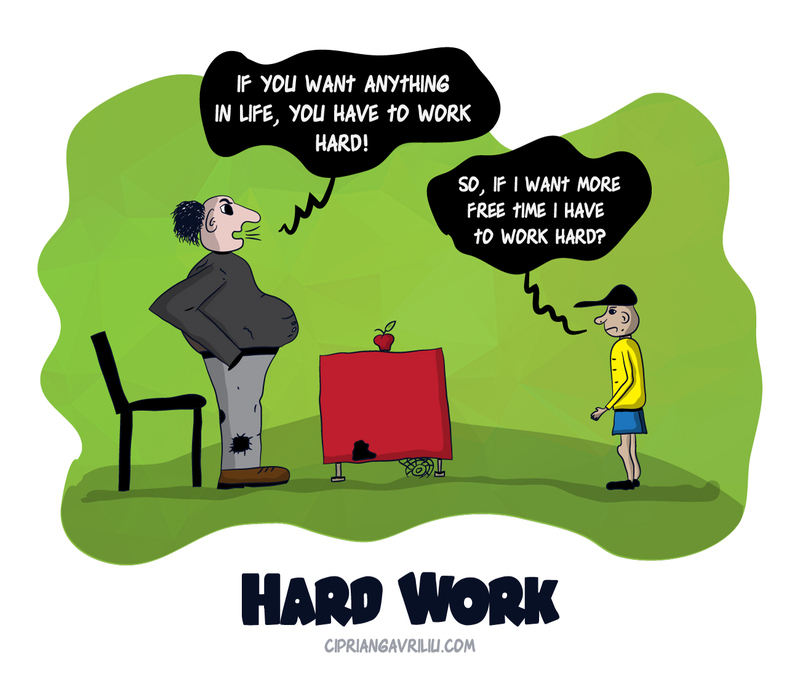 Article name: Is hard work really the answer? How to work less, earn more, have a bigger impact and do magic in the process. You can read it here: http://www.cipriangavriliu.com/is-hard-work-really-the-answer-how-to-work-less-earn-more-have-a-bigger-impact-and-do-magic-in-the-process/.